Bravo!!!!!!!!!!!!!!!!!!!!!!!!!!!!!!!!!!!!!! That was outstanding my friend!!! That was SWEET!!!! JuanFiddler. You play nice. 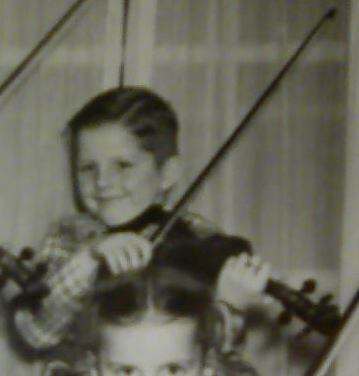 > Is that concert master violin from the FiddlerShop? I have been window shopping over there. > Your instrument sounded very sweet > you made it sing. That sounds great, JuanFiddler. You're doing so well, especially with vibrato it's sweet. I've played that one off and on without shifting and have never made it sound that good. Very nice Juan! I just started working on that one tonight, inspired by your video. I hope to be able to play it as well as you some day. very nice Juan!! sounds reallly familiar!.. keep it up and work those slides in there!! the rest sounds awesome!! Great job Juan. You are seriously improving. Sounded real nice, Juan, I wish my Concert Master sounded that good. Maybe it's time for another set of string's and adjust the sound post. I know this isn't Critique Corner, but I was watching your bowing wrist, not a lot of flex, it seems a bit stiff. That was beautiful! Well done Juan! Bravo! When it comes to the sound of any particular instrument, remember that the acoustics in a particular space play a large role in the resulting sound. We actually put Zyex on Juan's violin when he was here. As a matter of fact fiddlestix, last night i was doing some retrospective watching all of the videos i've recorded with the concert master and in this very last one my wrist is a loose as it can be, still working on that though but i felt no tension whatsoever, if you look closely, I was rocking my body to help me deal with angles and partly to stay relaxed. I've noticed that if i play standing still on spot, tensions of any kind start to show. But thank you for the critique, it's always well received. Great video and playing Juan! Thanks for sharing this. It's funny though, for the longest time I was starting to think that I was the only one who would move around a bit while practicing lol. I find the same true here as well, a slow rocking or moving a bit around the room as I play helps not only relieve tension but the acoustics sound different in certain areas so it becomes a dual purpose practice incentive/scientific audio experiment haha. Great tune, great playing, great version... Great everything! Keep up the good work you're doing really great. I love that song. Nice play Juan. You had a great vibrato working its way in there too. Thank you guys very much for your comments, it really is a pat on the back to come back and read all of your feedback. Very nicely done Thinking that I might need to find my music on that one and pull it out again. another fine one, JUan. I liked the slow lead up to the notes and some interspersed increase in speed on some of it. Sounded your intonation was perfect. That's ready for professional performance, man.